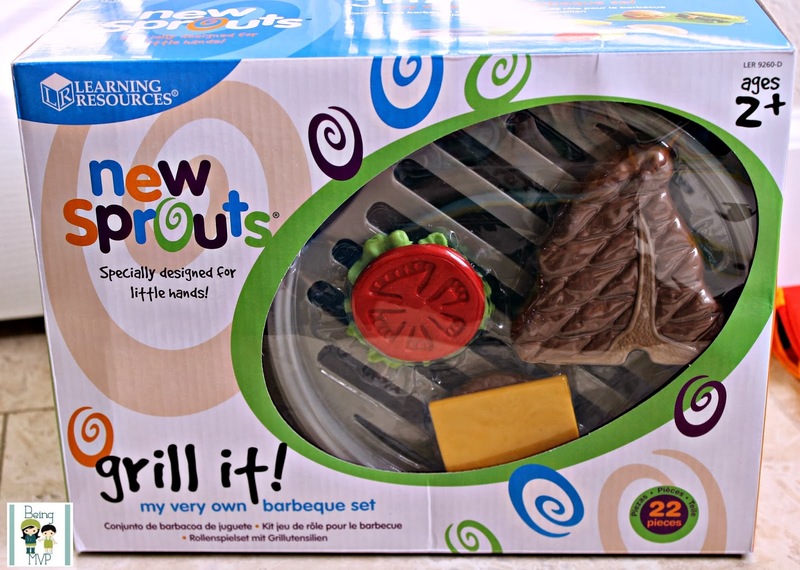 Learning Resources has come out with a new product - New Sprouts® Grill it! - which is the perfect addition to all our other New Sprouts® products. When it arrived for review, Kenzie kept asking what it was and if she could open it. I waited until she cleaned up her toys and then opened it since Mason was waiting as well. This is a fun play grill set that includes the following: 1 kettle-style, 4½"H x 8" in diameter grill w/removable grate, 2 burgers w/buns, 1 chicken breast, 1 steak, 2 slices of cheese, 2 pieces of lettuce, 2 tomato slices, 2 ears of corn, 2 asparagus bundles, and 1 pair of tongs. Mason took to the play barbeque set like a pro and tried picking up the food with the tongs. He has to work on his coordination a wee bit better but he can hold a piece of meat for several seconds! I showed him how to play the food atop the grill but he had more fun with the tongs and meat. Kenzie, on the other hand, was the master of the grill and cooked like a pro. She loves her variety of play food from Learning Resources and this one was extra special because she was doing something that daddy does often. 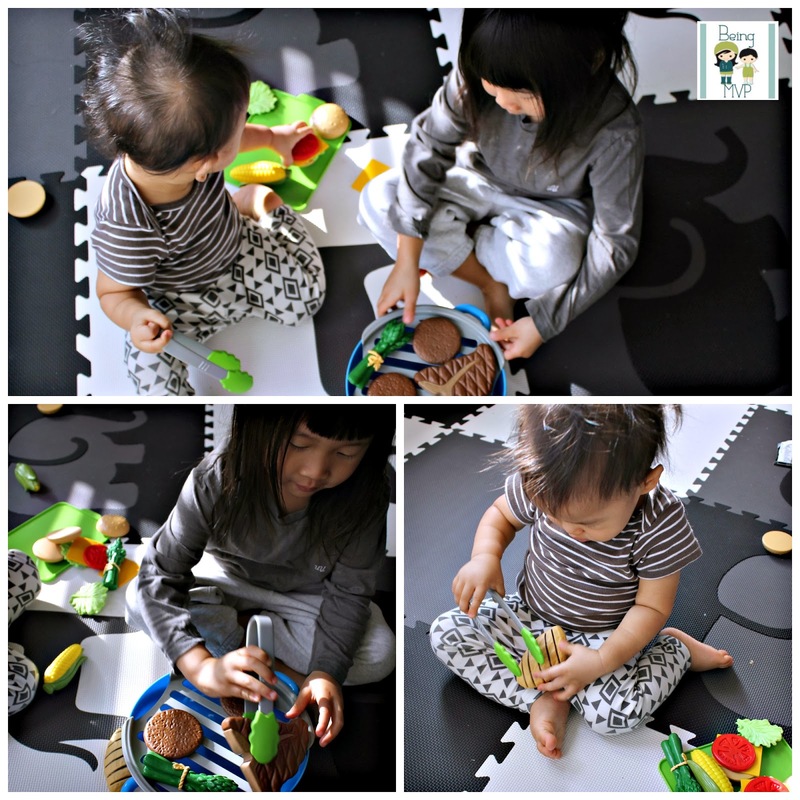 The pieces are really friendly for little hands and they are pretty realistic. I love how the imagination continues with this set. They can play together and I only wish there was an additional set of tongs to avoid the tantrum that occurred. Yes, Kenzie throws a fit when she doesn't have control of the tongs. The asparagus is awesome as well as the seeded buns. Both can play semi-civilly and I have a few moments to myself. The best part is that all the pieces fit right inside and just plate the grate on top to store. Happy kids. Happy mama. Buy It: You can purchase the New Sprouts® Grill it! My Very Own Barbeque Set for $24.99. This is so cute! This would be perfect for little kids wanting to help out! This is very cute, we mostly cook with our grill in the summer so my boys would love this. This is the cutest food set! My grandson would love to "grill" while his daddy is grilling outside. Looks like great quality, too! omg this is great! 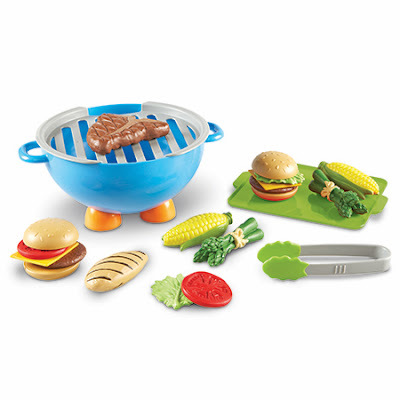 the kids love mimicking dad when he is on the grill now they can have their own set! love it! love that it includes healthy veggies and fruit! great play item!